He is about 10.5 inches tall. 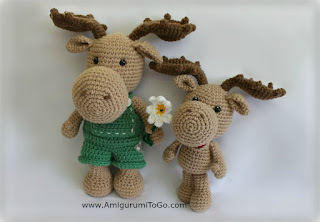 This is the smaller version of Art the Moose (also a free pattern here). 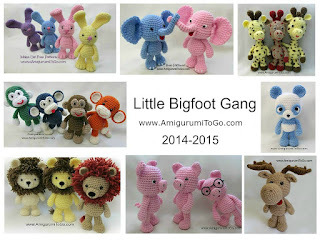 I designed the smaller one just to add a moose to my ever growing gang of Little Bigfoots, all free patterns and most have video tutorials! button at the bottom of this pattern and there you will also find the option to leave a donation. you can use buttons, a french knot or paint eyes on. I used 10mm safety eyes that I glued in place. *The head and body are worked in one piece. If you plan to install safety eyes they are placed in between the 10th and 11th row with 5 or 6 visible stitches between them.You can use anything from felt to paint to buttons for eyes. I glue in safety eyes with tacky glue or fabric glue after the doll is all done. If you need help with that, just leave a comment and I'll link you up to a video. sl st next st and f/o leaving a long tail for sewing. Add in the nostrils before or after sewing snout to head. If you do them before you will have to be mindful of centering. I prefer to put them in after. You can use French Knots or just add a whip stitch or 2, it's up to you. Partially stuff then sew most of the snout in place then stuff it completely before sewing up the remaining gap. 1) magic circle or adjustable loop with 6st (6) *work starting yarn tail into the 2nd row. sl st next st and f/o and leave a long tail for sewing. place wrong sides of the mouth and the tongue together, sew the end of the tongue to the mouth as pictured. Please note I borrowed this photo from my larger moose pattern. This is exactly the same and sewn together the same as the one you just made only larger. You can sew the mouth to the snout before or after you sew the snout to the head. I prefer after but you do what will work best for you. Sew the back end of mouth over and around the 12th to the 14th row of the snout and leave the front of the mouth open. I sewed the mouth off to one side a bit and not right in the center, that way you can see the mouth more. ch1, bring the corners of row 7 together and sc through both sides at the same time, going across to seal up the open edge. f/o leaving a tail for sewing. insert yarn in between the 4th and 5th row, ch 1 and add in 4hdc. 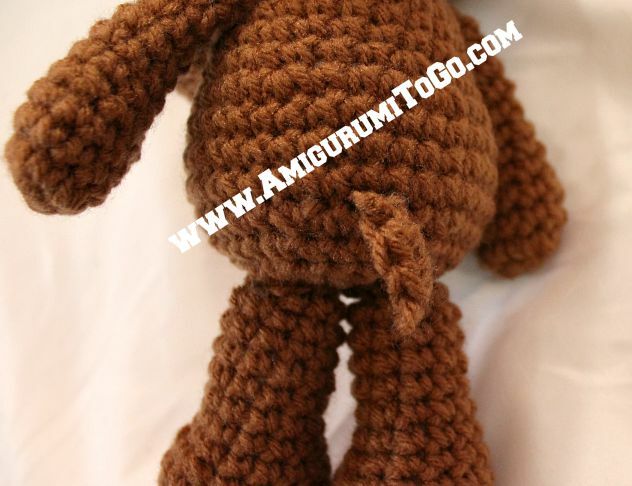 f/o leaving a tail for shaping, knot off then hide the yarn tails inside the hand. Please note I borrowed the arm and thumb photo from my larger moose pattern. They are done the same way. If you notice a difference between this photo and the thumbs you just made it's because these thumbs are made with hdc and the larger moose thumbs are made with dc. 2) sl st the 2nd ch from the hook, 1hdc in next 2 ch's, sl st last ch. f/o with a long enough tail you can sew into the body. For the points, flatten the antler then pull yarn through the side of the antler. ch1, put in 3hdc and f/o leaving a bit of a tail for shaping. You can use some anchor stitches to hold the pipe cleaners in place. I didn't feel the need to do that with this smaller moose. 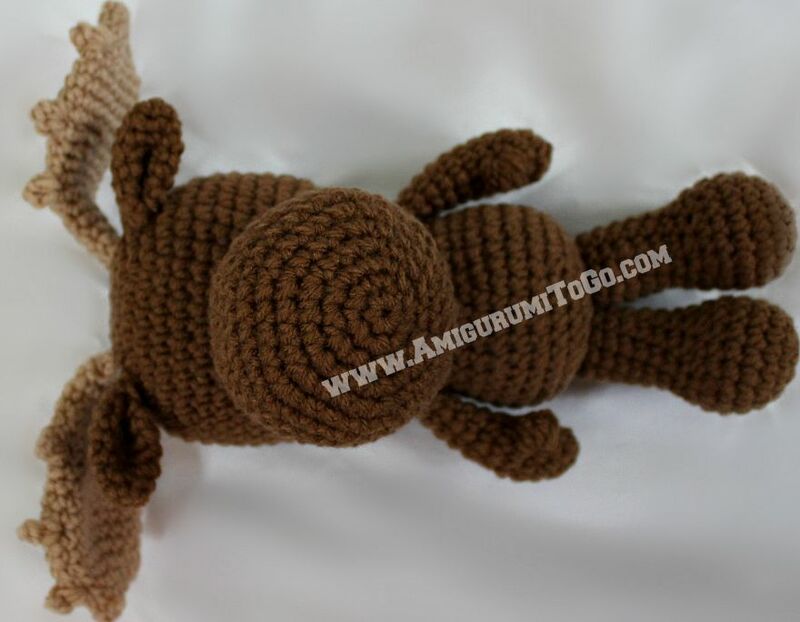 But if you want to add them please view the antler section of my larger moose for those instructions. MOOSE ASSEMBLY: Take your time when sewing. Take breaks when you need them. Use pins to hold the parts in place and play around with the placements to be sure you are happy with how the parts look before sewing them in permanently. 1) sew the arms on the 24th row or the 2nd row below the head. 4) sew the tail in between the 32nd and 33rd row. 5) sew antlers on the 3rd and 4th row. The pipe cleaners need to be wiggled into place. This part takes a bit of time but they will go in. Sew all around the edge of the antler and pull your stitches tight. 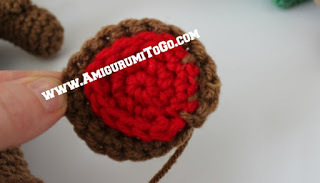 6) sew the ears on the 5th and 6th row. This little one is so cute. Great to see him together with his dad. Thanks so much for designing and sharing this great pattern. Thank you for making a moose! I live in NH and the moose is one of our state symbols and pretty prolific in our area so I can't wait to crochet your version. I love your patterns and videos. I learned to crochet when I was a teen but only recently picked it up again--you are my inspiration! can you say how much wool you need for this little Moose? I know that Comfort Wool has 16 oZ each...do you need all of it? Thx! Sorry i don't see the FAQ before! Hi. I have made a few of your animals. They are amazing and so easy to follow. I only started crocheting the a few weeks ago and learnt from your youtube videos. I am struggling with the thumbs on this. Are there any videos or more hints on how to start them off? I am so glad I found your blog, thank you for the amazing patterns. I am working on the moose to take with me on a cruise in August. I also love your YouTube tutorials. I am new at making animals so they are very helpful. Are you going to make one for the Little Big Foot Moose? I am struggling with the Antlers. Thanks you for the nice Patterns love it. Greetings from Amsterdam Holland. if nothing pops up then you might have pop ups blocked. You would have to google that to find out how to fix it. oh that's too bad! There's nothing I can do to fix that though, I use it here on my blog as it's a free service. They don't have a place I could call or write to. But this is the first time I've heard of that issue. Maybe a glitch? If you have notepad or word on your computer, I do have copy and paste enabled. You could copy, even photos, and paste into any program you have. Hope that helps! Do you happen to have the overalls pattern foe the smaller version? Or any tips for making a smaller version based on the larger overalls? RECENTLY I DISCOVER YOUR PAGE AND I FOUND THAT EVERYTHING THERE IS LOVELY. MY FIRST LABOR WAS THE TINY SQUIRREL (IT`S SO CUTE! ), FOLLOWING BY THE ACORN... MY GRAND DAUTHER SAID THAT NOW THE SQUIRREL IS HAPPY! IN THIS MOMENT I`M WORKING IN THE LITTLE TURTLE. I THINK THAT YOUR VIDEOS HAVE A VERY GOOD QUALITY. MY LANGUAJE IS SPANISH AND I UNDERSTOOD VERY WELL THE ELEPHANT`S VIDEO. ALSO YOUR PATTERNS ARE VERY EASY TO FOLLOW. I AM "IN LOVE WITH YOUR TINY ANIMALS" AND WILL LIKE TO DOWNLOAD MORE VIDEOS AS THE MOOSE, THE MINI WEDDING BEARS, THE SHUNK, LIL`OAK THE HIDDING TREE (FOR MY TINY SQUIRREL). PLEASE IF IS POSIBLE SEND ME A LINK to a Little Bigfoot Moose video.